It's funny how some games, despite being big hits, then they are not overly copied or plagiarized, and hard to find quality alternatives of the same style. We say this because playing Guns, Gore & Cannoli, a modest independent capacity development by Belgian Crazy Monkey Studios, we have realized that there are not many clones of Metal Slug, the great action saga of SNK which began in 1996, and which has seven main deliveries and a few remakes and spin-off. Perhaps because they have been so many games in this series has never been a need to fill this gap in the market, but that in the mid to late 90's still frequented the beloved arcade, this saga and this particular genre would have much affection, and we would not mind seeing more proposals Style as usual. This is the proposal Guns, Gore & Cannoli, an action game in 2D with the spirit of the arcades of the 90s, no more complications than shoot everything that moves, without a system of progression, experience points or nothing that you are fit. Guns, Gore & Cannoli brings us to the United States in the roaring 20s, at the height of Prohibition, putting Vinnie skin Cannoli, a gangster who has to visit the fictional town of Thugtown for a little job, meeting a zombie apocalypse in which for some strange reason alone gangsters have escaped become these horrible creatures. Through, a short cinematic sequence we narrate us a nice, simple story, enough for an action game whose only claims are that Liem we shot everything that moves. The premise is quite original as you see, that to mix media mafia of the 20s with the hackneyed zombies, and gives rise to have to face us tons of relatively varied enemies. Since all kinds of zombie creatures strictly comply with all the clichés of the genre, such as slow, fast, big and fat that explode when they die, etc., different types of gangsters who use guns, and even soldiers they have taken the city to prevent the epidemic from spreading throughout the country. The amazing thing about Guns, Gore & Cannoli is its proposal so minimalist, as in the 2015 we are used to any type of game, either action, adventure, role or platforms have to have some kind of progression, the characters go getting new skills, improve their features, new weapons, and so on. In this game no, collectibles or secondary objectives, and we have to overcome limiting phases eliminating hundreds of enemies, moving sideways, jumping, and switching between the different weapons that we pick up along the way. Shotguns, pistols, machine guns, rifles, rocket launchers, flame throwers, grenades, Molotov cocktails and even a special ray gun frying enemies, the whole arsenal at our disposal is useful and we must learn to take advantage because they do not spare the ammunition, and depending on the situation, which for example is more or less enemies, or are more rapid or robust, is convenient to use a weapon or another. At first it may seem a very easy and too simple game, but soon things get complicated, more varied, plentiful and dangerous enemies, and medium difficulty playing alone, is not exactly simple. But neither it comes to be frustrating to have a series of checkpoints reasonably well placed. If we mentioned before it is a game with arcade spirit, we referred to the gameplay, rather than to other aspects, such as lack of a scoring system, and we don’t have the classic lives reappear in unlimited checkpoints. These details betray a little the spirit of the arcades and away from being a clone of Metal Slug, playable with other details such as the fact that we cannot shoot vertically, only left and right. We don’t like too much the melee, a kick not too useful, and perhaps would have been nice a knife or something similar to shake off the dozens of zombies that we are put on top. There are some pretty interesting bosses, new enemies are added along the adventure that provides variety, and the platform is irrelevant, only in very specific moments we need to refine the jump. Interestingly when in the Ecuador game start to mix human and zombie enemies, because not everyone is going against us, but they face each other well, and very funny and unpredictable situations are generated. Although we have not said so far, the head shots are rewarded, but not easy to achieve them, and we cannot point freely, and just shoot sideways. 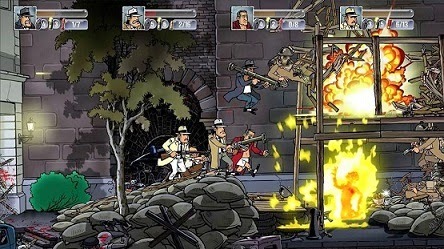 It can be overcome in about three hours, and where Guns, Gore & Cannoli win many integers is in the cooperative multiplayer mode for four players, though only locally, there is no online play. Thus the game becomes much more chaotic and crazy, but also more fun, and if you plan to play this way you have to know that deserves much more worth it if you play alone, which becomes repetitive and flat, but also more challenging. Graphically it is pretty cool, with hand-drawn graphics that seen in images may seem too flash something that they say scornfully, but once you start to play you find that has a section visually elaborate. Some worked with many details scenarios that create a good atmosphere of American city in full 20s, varied design and friendly enemies, and small "luxuries" to exploit technical and cars, very well done. Shaky animations, both protagonists and enemies, and some jerks at peak times, when many enemies on screen together, can be annoying. Comply with good sound effects, sound blunt weapons, and the soundtrack is not bad but goes quite unnoticed, a shame, because if something we like in a good arcade game is to have catchy melodies. The major strengths of Guns, Gore & Cannoli are not too belong to a genre currently exploited, its unpretentiousness and good work broadly, because even if certain details and content have made it a much better game than it is , note that the modest studio Crazy Monkey Studios has put care and affection to his work. A 2D action game from the old school, simple, direct, friendly and unadorned, if you plan to play in the company's highly recommended, despite its shortcomings."